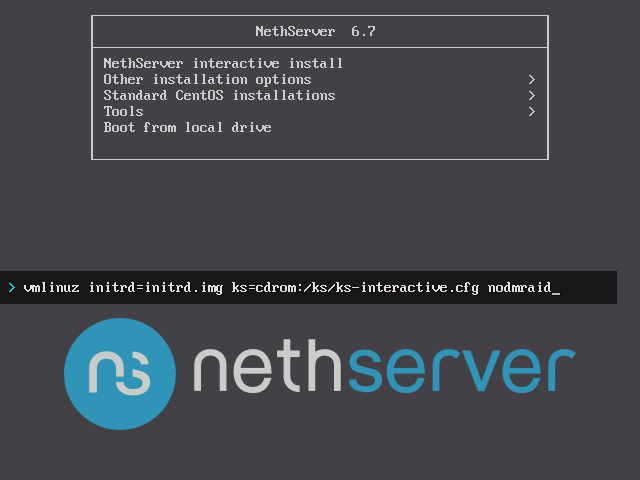 NethServer interactive install allows you to select the language, Software RAID, and network settings. Advanced settings can be specified by editing its boot options. The boot menu allows you to specify advanced boot options to further customize the installation. To specify additional parameters, highlight the desired menu entry then press the [↹ Tab] key to reveal its boot options. Towards the bottom of the screen, you should see the boot loader command line where extra parameters can be set. hit the [↵ Enter] key to confirm the boot options and start the interactive installation. Otherwise, press the [Esc] key to cancel the edition. 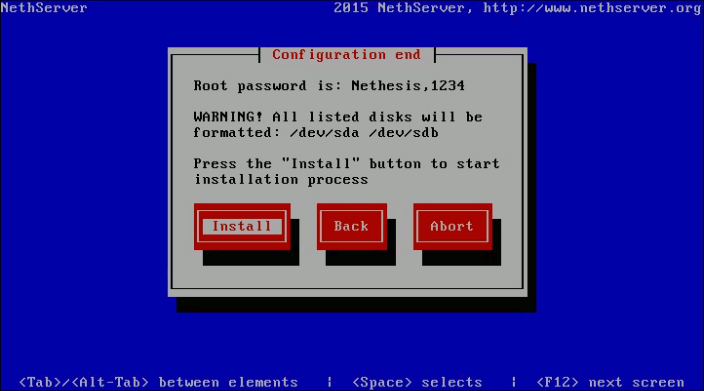 Once at NethServer installation's boot menu, select the NethServer interactive install menu entry and press the [↵ Enter] key to start the installer in interactive mode. Otherwise ⏤if no action is taken on the keyboard⏤, the default option (interactive install) will be executed after the timer runs out. To move around the installer options, use the keyboard. [↑ Up] arrow key: used to select previous item in a list. [↓ Down] arrow key: used to select next item in a list. [↹ Tab] key and [→ Right] arrow key: used to cycle forward between elements. [Alt]+[↹ Tab] keys combination and [← Left] arrow key: used to cycle backwards between elements. [↵ Enter] key: used to confirm an option (applies mainly to buttons). [Space] key: used to confirm an option (applies to buttons). [F12] key: used to show next screen. [Ctrl]+[Alt]+[Del] keys combination: used to abort the installation. You may abort the installation process without consequence at any time prior to selecting [Install] at the Configuration end screen. Although alternative navigation keys may exist ([Start], [End], [Page Up], [Page Down]…), the described navigation options are enough to do the tasks. In the first screen dialog you can select the language in which you want to use the interactive mode. 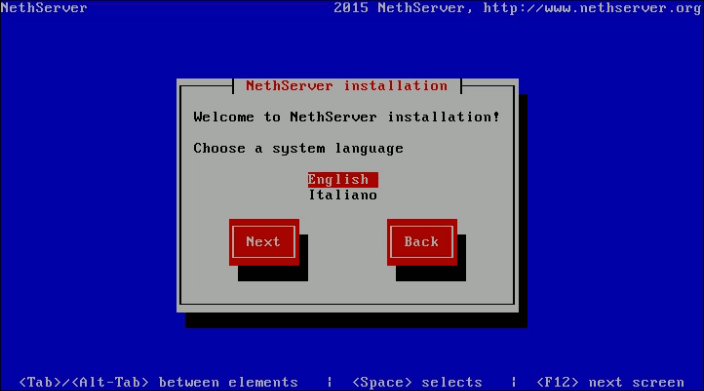 In NethServer 6.7 the available languages are English and Italiano. For instance, you can select English (which is the preselected language), hit the [↹ Tab] key to move to the button labeled as [Next], then press the [↵ Enter] key to confirm your selection. System language is always set to English. The Software RAID screen dialog is displayed when two or more disks were detected at start. RAID (Redundant Array of Independent Disks) allows you to combine all the disks in order to achieve fault tolerance and an increase in performance. This screen lets you enable or dismiss this functionality. To dismiss Software RAID, use the [↹ Tab] key to select [No], then press the [↵ Enter] key to confirm your selection, and continue with the network configuration. To enable Software RAID, select [Yes] and press the [↵ Enter] key. 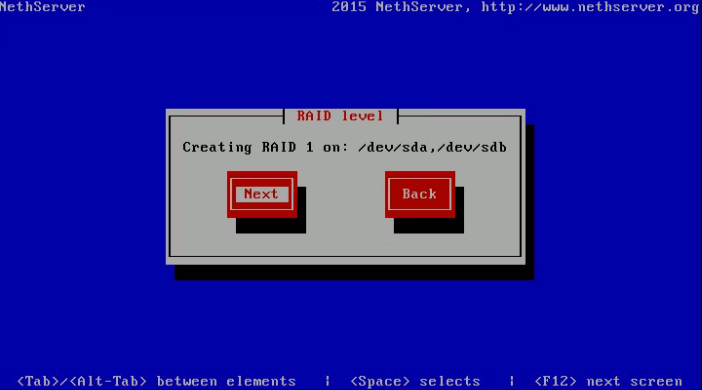 a) If only two disks are present, NethServer will create a RAID 1 array. A RAID level confirmation dialog will be shown, listing the assigned RAID level and the disks that will form the array. Select [Next] and press the [↵ Enter] key to confirm the options, and continue with the network configuration. 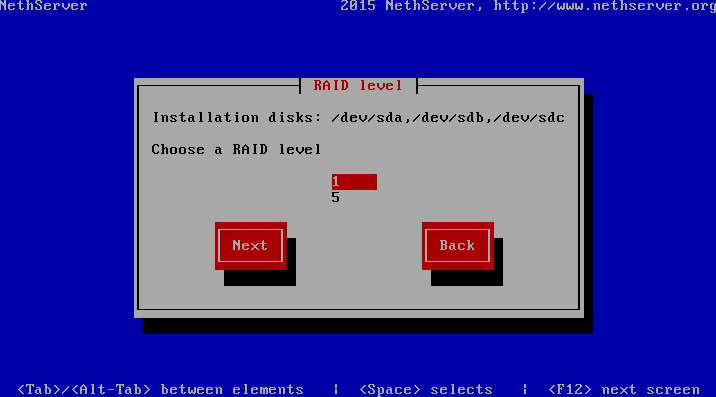 b) If there are more than two disks, NethServer will list them and let you choose the RAID level. On the RAID level screen dialog, use the [↑ Up] and [↓ Down] arrow keys to choose the desired RAID level. Then use the [↹ Tab] key to move to the button labeled as [Next], and press the [↵ Enter] key to confirm your selection. If disk number is greater than the minimum required by the selected RAID level, NethServer will offer you to reserve one disk as hot spare. A spare disk will be added to the RAID in case a failure occurs. On the Enable spare disk screen dialog, you can choose to reserve one disk as hot spare. To reserve one disk as hot spare, select [Yes] and press the [↵ Enter] key to confirm your selection. To dismiss it, select [No] instead. In order to provide services, the server must be reachable within the network. To do so, you have to properly configure its network interface having in mind your network infrastructure and the role NethServer will play in it. A server can have one or more network interfaces, so it can fit in different network scenarios. Two common server modes are: Server mode, and Gateway mode. In the Network interfaces screen dialog you can select the network interface that will be used to access the LAN (Local Area Network). This interface is also known as GREEN interface. To select the GREEN interface use the [↑ Up] and [↓ Down] arrow keys. Once selected, hit the [↹ Tab] key to move to the button labeled as [Next], then press the [↵ Enter] key to confirm your selection. This is only a recommended convention, but not mandatory. After the network interface for the LAN has been selected, you can specify its parameters (IP address, netmask, gateway, and DNS server) in the Network configuration screen dialog. Type a private IP address to be assigned to NethServer. If you want to install it in an existing network, you must provide an unused IP address valid for that network. Type the subnet mask of the network. Type the IP address of the gateway used on the network in which you are installing the server (for instance, the router's IP address). If the server is to be used as Gateway, you can specify same NethServer's IP address. Take note about the network parameters you set. You will need them to access the server-manager. 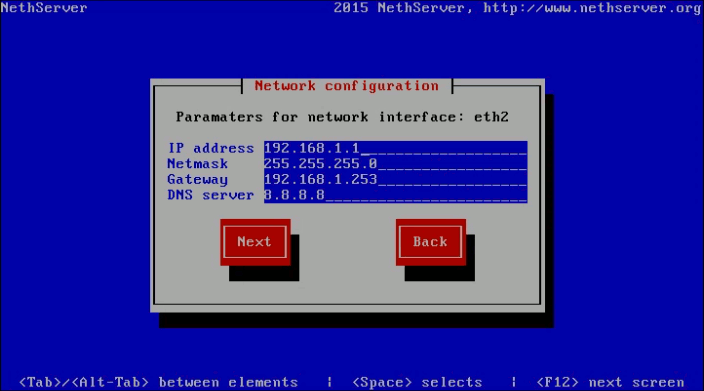 For instance, if you are installing NethServer to be used in Server mode on a network with a Router/modem that has the 192.168.0.1 IP address, with a 255.255.255.0 netmask, you can configure NethServer with an unused IP on the same network range, like 192.168.0.10 with a 255.255.255.0 netmask and use the router's IP (192.168.0.1) as the gateway. External access provided by the ISP Router configured with a 192.168.0.1 IP address. NethServer RED interface configured with an IP address of 192.168.0.10, connected to the Router. 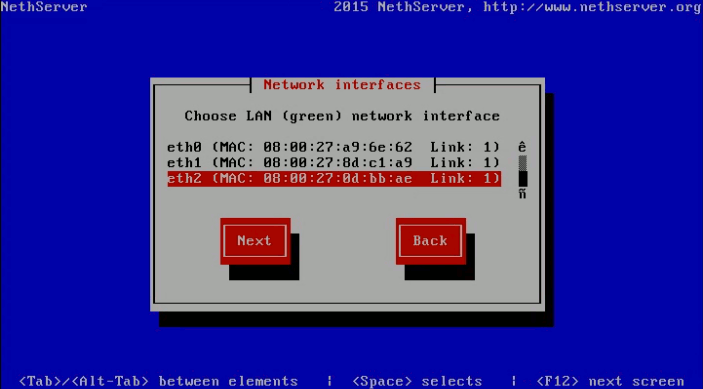 A switch interconnecting the client workstations and NethServer GREEN interface. The workstations configured with IP addresses on the same network range as the GREEN interface. This can be easily done configuring NethServer to provide IP addresses through DHCP. After the network parameters have been set, press the [↹ Tab] key to move to the button labeled as [Next] and hit the [↵ Enter] key to continue with the installation. The Configuration end screen dialog is the last installation step, and the last opportunity you have to make changes or abort the installation before the changes are written to disk. In this screen you will also find the server's login credentials. To start the installation process, select [Install] and press the [↵ Enter] key. The installer will switch from text mode to graphical mode, where you will see the installation's progress bar. Wait until the process finishes. At the end, the system will reboot and you can remove the installation media. Finally, you will be presented with the login prompt (where, upon login, you will be able to do advanced administration tasks). At the end of the installation procedure, access the server-manager to personalize the configuration and to install additional software.